Canadian National Railway reported April 23 first-quarter net income of C$741 million, or $1 a share, on revenues of $3.2 billion, a decline of $12 million. Net income was down 16% and earnings per share declined nearly 14% compared with the first quarter of 2017. The first-quarter results matched estimates made by analysts surveyed by Bloomberg. Revenue ton-miles declined by 4% while operating expenses rose 9% to $2.2 billion. Issues with a surge in traffic and the resulting network congestion last year led to the resignation in the first quarter of CEO Luc Jobin, who was replaced on an interim basis by Chief Marketing Officer Jean-Jacques Ruest. The railroad announced today it had increased its planned spending this year on infrastructure by $200 million to $3.4 billion. One focus is new track and yard capacity to better handle traffic through its West Coast to Chicago corridor. On April 18 it said it would purchase 350 premium boxcars to meet growing demand in the forest products and metals business. The 50-foot cars are scheduled to be delivered in late summer. “We’ve increased our capital program to $3.4 billion with approximately $400 million being invested in new track infrastructure, particularly in Western Canada, to build capacity and improve resiliency,” said Ruest. The company is adding double-track sections in many areas, cutting wait times for trains and improving efficiency, Mike Cory, executive vice president, told analysts. 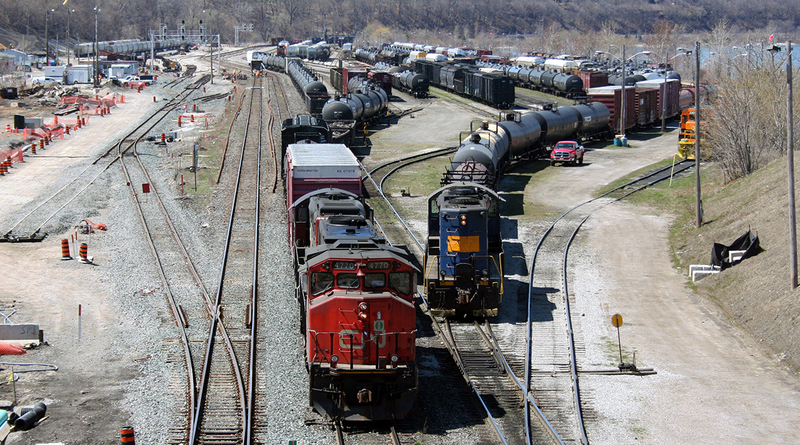 The railroad’s largest product divisions are intermodal, petroleum and chemicals, grain and fertilizers, and forest products. The intermodal unit reported revenues of $814 million, up 10% from a year ago, while revenue ton-miles rose 5% to 14.4 billion. Petroleum and chemicals saw revenues drop 3% to $564 million as RTMs dropped 10% to 10.6 billion. Grain and fertilizers reported an 11% decline in revenues to $539 million as RTM dropped 12% to 13.6 billion. Forest products revenues of $422 million were down 6% from a year ago, while RTM for the division fell 9% to $6.9 billion. Montreal-based Canadian National transports about $250 billion worth of goods annually in Canada and the U.S.